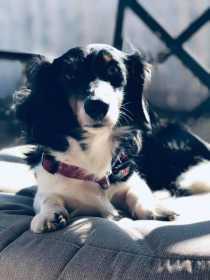 Missing long haired black and white dachshund. Male, has a brown boy diaper on and red collar. Please share and contact 405-921-6339 if found or seen. Went missing from the Deer Run neighborhood off of 66.